Choosing essential cleaning tools will help make your cleaning your home easier. These 14 are a great place to start! Cleaning your home takes more than elbow grease and time … it also takes products. Choosing the right products will make your cleaning go easily – not only will they simplify your chores, but they’ll also save you time. Finding the right products isn’t always easy, though. Just walk down the cleaning aisle at any store, and you’ll find hundreds of possibilities. How do you know what will work well, though? And how do you know what’s safe for your health? When you’re wondering if your cleaning products are safe to use – or not – check out the Environmental Working Group’s Guide to Healthy Cleaning. I’ve done my fair share of buying and trying different cleaning products through the years, and I’ve made my own list of 14 essential cleaning tools for any home. All-purpose cleaning sprays are handy to spray on hard surfaces … and wipe off. Baking soda is handy in that it can freshen up areas, but also doubles as a great scrubbing agent in homemade cleaners. You never know when you might need to use it. 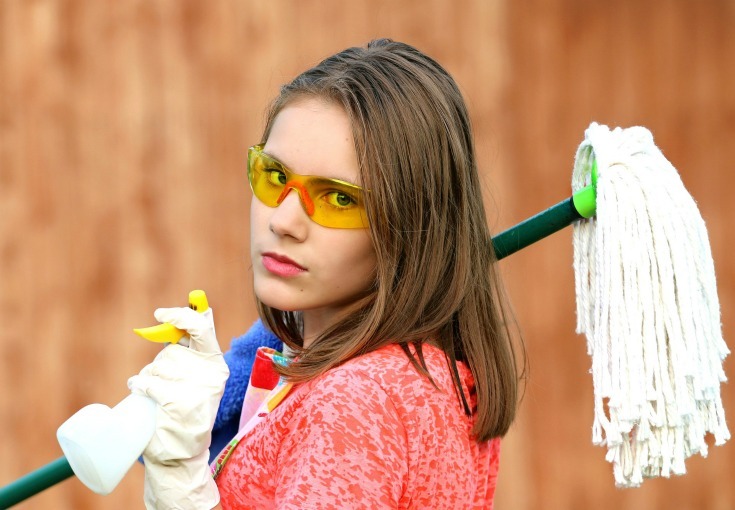 A broom and dustpan are handy for sweeping hard floors … and also for sweeping up outside. You can use cleaning cloths and rags to thoroughly clean just about every surface in your home. I use my Norwex EnviroCloth to clean everything – with just tap water and the Norwex microfiber cloth. This single supply has saved me more time and energy than I can even count. Before I started using Norwex, though, I’d use cloth diapers (prefolds) for dusting rags, old washcloths and towels for other cleaning rags around my house. You never know when you might need to scrub something with soapy water and a cleaning rag. Sometimes, when you have caked on dirt and grime, you need a little abrasion. That’s where a cleaning scrub comes in handy. Soft Scrub is a typical option, but you can create your own safe cleaning scrub by using a mixture of baking soda and castile soap. My favorite (and safe) cleaning scrub is Shaklee’s Scour Off, made with ground up cherry pits. It works so well, smells wonderful … and is powerful enough to remove stubborn hard water stains! A close second is Campanelli’s Cleaning Paste. When washing dishes by hand, use a dish cloth and dish soap. When your dish cloths get old and ratty looking, recycle them as cleaning rags. Move over, bleach. Hydrogen peroxide has the same kind of disinfecting power … but it’s actually safe to use. I’m partial to Murphy Oil Soap because I grew up using it – but also, it does a great job cleaning hardwood, and is fairly safe to use. Liquid castile soap also is a personal favorite, and I always make sure I have at least one bottle on hand. My favorite dish soap is Mrs. Meyer’s, because of the amazing scents. Washing dishes by hand always was so utterly boring, but the scents actually make me not mind the chore. (My absolute all-time favorite is lilac, followed by geranium and radish. I’m not a fan of the bluebell or lemon verbena, though.) And my favorite liquid laundry detergent is eCover Zero. If you have a hard floor that needs mopped, you’ll need a mop. I’ve used Swiffers, plastic mops with replaceable sponge mop heads, and my Norwex mop. Go with whatever mop you can afford. This decision also will be based on how many floors you have to clean. In a pinch (or to do a really thorough job), just mop on your hands and knees with a cleaning rag and warm, soapy water. It’s always good to keep paper towels handy, just in case you need to clean up a particularly dirty area. For example, I wipe up all-purpose spray with paper towels when I’m cleaning toilets. They’re also good to use if you wash windows with a liquid window cleaner. You may want to use a sponge when you’re washing dishes – or surfaces. It depends a lot on your preference, though – this may not be absolutely essential for your home. If it is, make sure to replace your sponge frequently. The surface of your sponge can be one of the dirtiest things in your home. When you’re scrubbing toilets, you’ll need a toilet brush. If you have carpet, you’ll need a vacuum cleaner. Your vacuum cleaner also can be used to clean under cushions – or to sweep up your car seats. 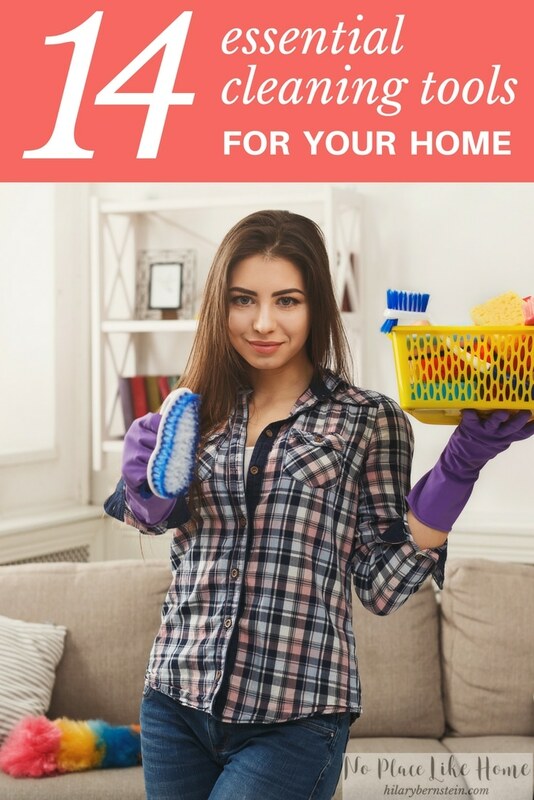 With these 14 essential cleaning tools, I can thoroughly clean any area in my home … and you can, too! What do you consider as your essential cleaning tools? 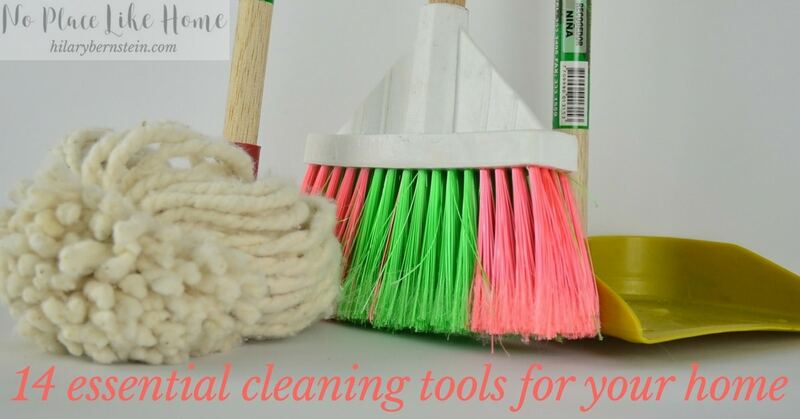 I’m glad that I was able to come across with your article and learn the list of cleaning tools for your home. I found it interesting that you can recycle your dishcloth as cleaning rags when they get old and ratty looking. I’ll make sure to consider this in the future. Thanks for the good read!